5.1 Why not let my employer host your site for free? 5.2 I can not login. It says that I am already logged in. The Foundation for the Advancement of Information Technologies: ReactOS Foundation was a non-profit organization that provided support and promotion for the ReactOS Project. The Foundation managed the various resources and places them at the disposal of the project developers and handled logistical matters involving funding, presentations at conventions, and recruitment of new developers and other positions within the ReactOS Project. It was dissolved in 2015. The primary objective of the ReactOS Project is to create an operating system that is binary compatible with applications and drivers developed for the Windows NT series of operating systems. To help further this goal, the ReactOS Foundation existed as an administrative and logistical entity, offering support for the project developers as well as engaging the ReactOS community and providing an avenue for communication and transparency. The Foundation as a whole existed in two tiers, with the administrative body based in Russia and regional branches that handled donations in their respective regions. This structure existed because of the differences in how laws deal with transfering money to Russia from Europe and the Americas. All branches and the administrative body were registered as non-profits in their respective regions. While the foundation was dissolved in 2015, a registered charity based in Germany, ReactOS Deutschland e.V. continues to operate. 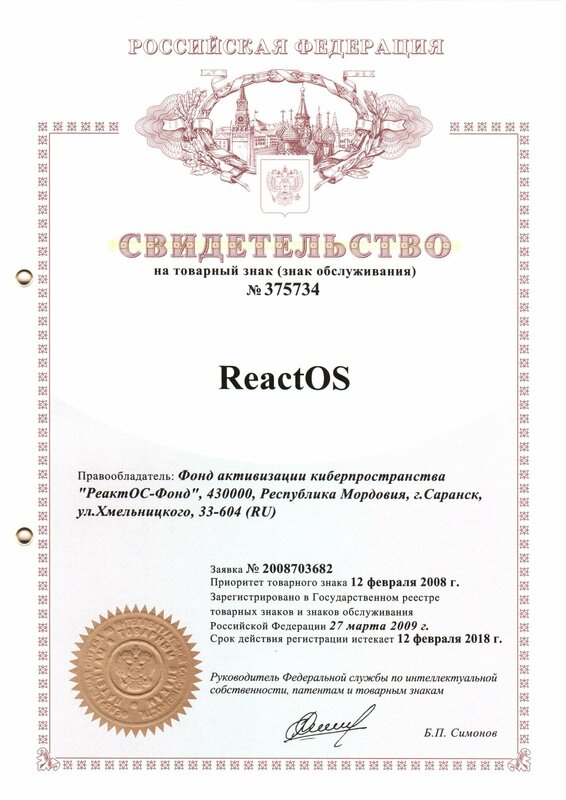 The ReactOS Foundation was established on June 5, 2002 and was based in Saransk, Russia. 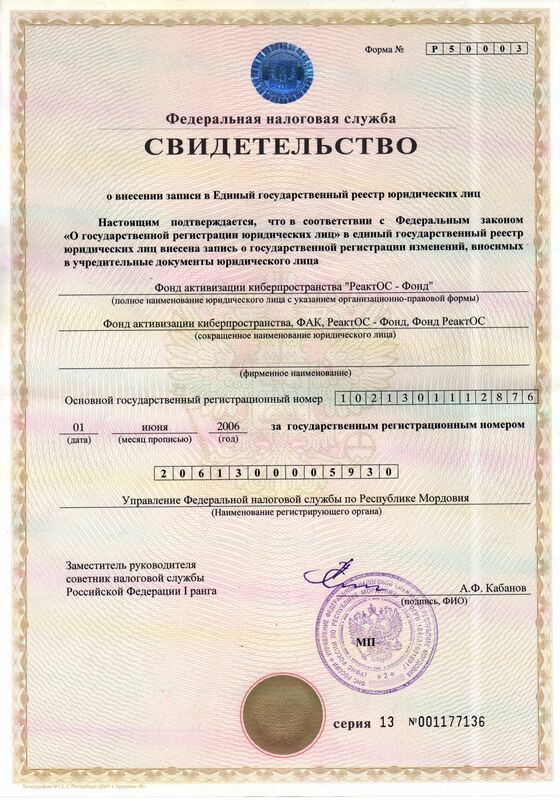 It was registered as a non-profit organization under Russian Federal law. The Foundation operated under the guidelines of the ReactOS Foundation By-laws and served as the primary support body for the Project, assisting in the development of ReactOS and various subprojects within its purview. Additionally, management of trademarks, funding, and other legal matters were handled by the Foundation. If you found an issue with the website and/or want to help, please visit the website forum, the #reactos-web IRC channel or the ros-web mailing list. Christoph von Wittich: helped with the xhtml 1.0 to xhtml 1.1 convert process. If you want to be listed here, please visit #reactos-web IRC channel and ask a dev. The www.reactos.org website is running on a Pentium 4 (3200/800/2M EM64T - SR1425) server with 2 GB of RAM connected with 100 Mbit/s to the internet. Please donate money so that we can afford the server hosting and hardware. Why not let my employer host your site for free? Thanks for the offer, but no, thanks. Things may change within your organization and then we'd be either politely asked to start paying X amount or go elsewhere. With our current setup, we have direct access to the machine, bandwidth is not a problem, although the hardware does need improvement (if you wish to donate hardware for this cause, contact one of the ReactOS coordinators). I can not login. It says that I am already logged in. This problem is being worked on. However, as a workaround to login again, you can use the "Did you forget your Password?" link and change your password; your old sesion will be deleted and you can login again using the new password. After that, remember to change the "multisession" option in your profile, which will allow you to login multiple times.